Maurice Jones-Drew had a breakout season in 2008, finally pushing an aging Fred Taylor to the side and becoming the main man in the Jacksonville Jaguars’ offense. Jones-Drew’s resulting fantasy football numbers were impressive: impressive enough that he’s being touted as the #2 running back behind Adrian Peterson in many fantasy football drafts in 2009. So is Maurice Jones-Drew really worthy of the 2nd overall pick in 2009 fantasy football drafts? That’s where the #2 rusher normally goes. Well, that sounds crazy at first glance. 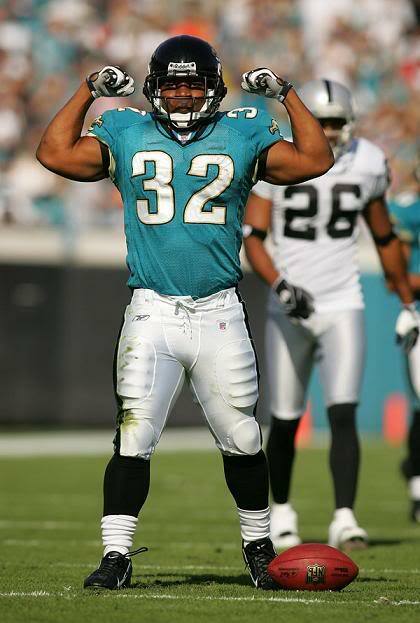 Maurice Jones-Drew stands 5’6" or 5’7" by most records, which is tiny by NFL standards. Sure, he’s got thickness and he’s never shown a propensity to injury, but how long can a guy like that hold up to the wear-and-tear of the NFL? Of course, you could say the same about any NFL running back these days, which is perhaps why many complain that fantasy football is more of a crapshoot than it ever was. Collect your 1st round runner and pray he plays at least 14 games – and plays them without a nagging hamstring, high ankle sprain or turf toe injury. One reason there’s so much uncertainty at the top of the fantasy football drafts this year is the lack of consistency. That is, there’s been so much turnover from last year’s first round to this year’s, it’s hard to say which ff studs from last year will remain consistent. For instance, 2008 1st rounders who won’t be anywhere near there in 2009 include Joseph Addai, Ryan Grant, Larry Johnson and Willis McGahee – just off the top of my head. Meanwhile, players who were consistently 2nd round or later last year that are considered can’t miss studs in 2009 include Maurice Jones-Drew, Michael Turner, DeAngelo Williams and Matt Forte. There’s turnover every year in the 1st Round, of course, but we got used to seeing LaDainian Tomlinson at the top of the draft and names like LJ, McGahee and Addai (or Edgerrin before him) appearing every year in the 1st. Now LT2 is being listed down the board in the 1st round someplace, while Brian Westbrook (one of the most consistent performers these past 4 years or so) is coming off two offseason surgeries and isn’t even on the practice field yet. The point being, we are now being asked to draft 1st round runners from teams that haven’t been normally been fantasy football juggernauts, like the Jacksonville Jaguars, Atlanta Falcons, Carolina Panthers and Chicago Bears. It’s not like you’re grabbing a bunch of Colts, Patriots, Chargers and Saints here. That being said, Maurice Jones-Drew fits the criteria needed to become a solid #1 fantasy runner: the undisputed #1 RB on his team who has shown he could do it in the past. Despite his size, Maurice Jones-Drew may STILL have the fewest question marks of any fantasy rb this side of Adrian Peterson. Here’s what he has going for him. So you make the choice: is Maurice Jones-Drew’s stature going to cause you to shy away from him, when he has gotten injured less than most of the other running backs going in Fantasy Football 2009 Drafts? If I were drafting 2nd overall, I might well have to take the little guy. That being said, I’m hoping for a low draft slot in all my fantasy drafts this year.